Scientists have divided the ultraviolet part of the spectrum into three regions: the near ultraviolet, the far ultraviolet, and the extreme ultraviolet. The three regions are distinguished by how energetic the ultraviolet radiation is, and by the "wavelength" of the ultraviolet light, which is related to energy. The near ultraviolet, abbreviated NUV, is the light closest to optical or visible light. The extreme ultraviolet, abbreviated EUV, is the ultraviolet light closest to X-rays, and is the most energetic of the three types. 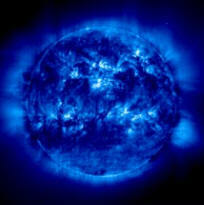 The far ultraviolet, abbreviated FUV, lies between the near and extreme ultraviolet regions. It is the least explored of the three regions. Our Sun emits light at all the different wavelengths in electromagnetic spectrum, but it is ultraviolet waves that are responsible for causing our sunburns. To the left is an image of the Sun taken at an Extreme Ultraviolet wavelength - 171 Angstroms to be exact. (An Angstrom is a unit length equal to 10-10 meters.) This image was taken by a satellite named SOHO and it shows what the Sun looked like on April 24, 2000.